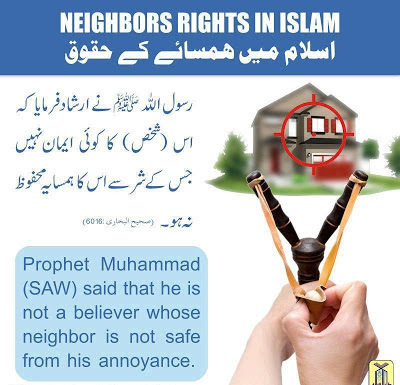 He is not a believer whose neighbour is not safe from his annoyance. "جب کوئی ایسا شخص تم سے رشتہ طلب گار بن کر آئے جس کے دین و اخلاق سے تم مطمئن ہوتو رشتہ دےدو۔ بلاوجہ تاخیر معاشرے میں بڑے فتنوں اور عظیم فساد کا باعث بنے گا". What Sort of Deeds in Islam are Good ? Narrated 'Abdullah bin 'Amr (R.A): A man asked the Beloved Prophet (S.A.W.W), "What sort of deeds or (what qualities of) Islam are good?" The Prophet replied, 'To feed (the poor) and greet those whom you know and those whom you do not Know. One of the major sins is to abuse your parents. 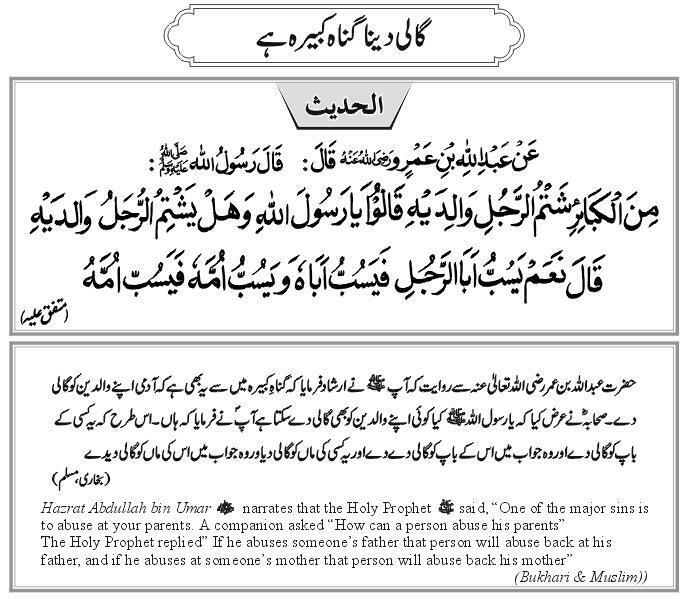 A Companion Asked How Can A Person Abuse His Parents. The Holy Prophet (P.B.U.H) replied. 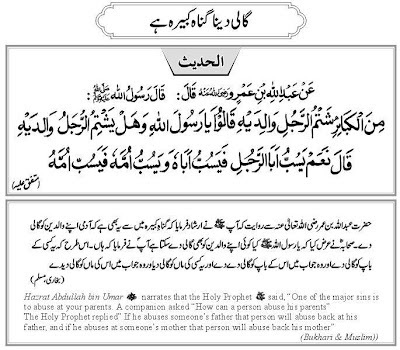 "If He Abuses Someones Father, That Person Abuse Back at His Father. And If He Abuses at Someones Mother ,That Person will Abuse Back His Mother". Hazrat Akrama states that, Hazrat Ibn Abbas (R.A) Said: Beloved Prophet (S.A.W.W) send Damnation on those men who make the look like women and send Damnation on those women who make the look like men. حضرت عکرمہ کا بیان ہے کہ حضرت ابن عبّاس رضی الله تعالیٰ عنھ نے فرمایا کہ رسول الله صلی اللہ علیہ وآلہ وسلم نے ان مردوں پر لعنت فرمائی ہے جو عورتوں کی وضع قطع اختیار کریں اور ان عورتوں پر لعنت فرمائی ہے جو مردوں کی وضع قطع اپنایں. Narrated Abu Huraira (R.A) that Beloved Prophet (S.A.W.W) Said: A time will come on people when man will don't care that the money (things) he earned is Halaal (Legal) or Haram (illegal). Have you ever seen me speaking a bad and dirty language? 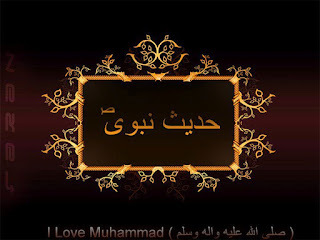 The Prophet (PBUH) said: “O ‘Aaishah (Razi Allah Ta'ala Anhu)! Have you ever seen me speaking a bad and dirty language? 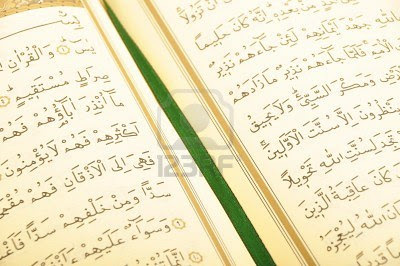 (Remember that) the worst people in Allah’s sight on the Day of Resurrection will be those whom the people desert or leave in order to save themselves from their dirty language or from their transgression. 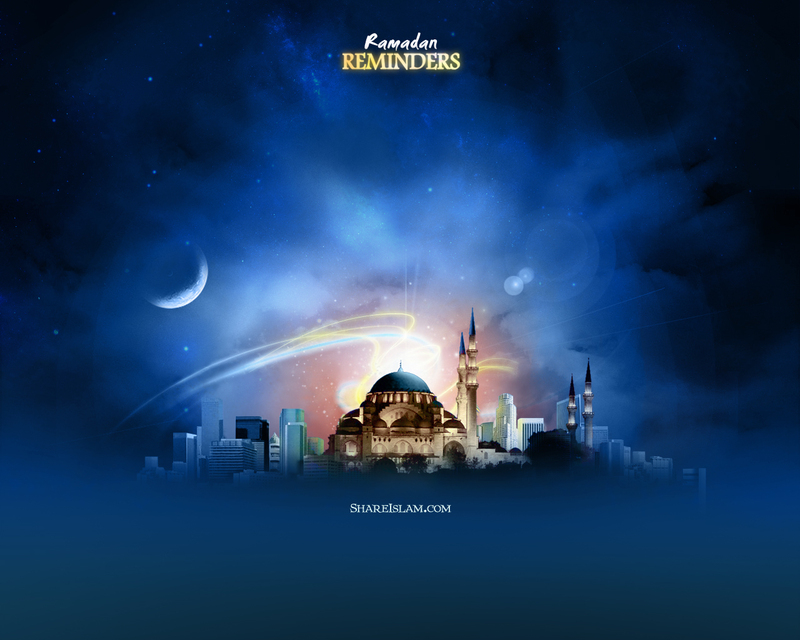 رسول (صلی اللہ علیہ واله وسلم) نے فرمایا، اے عائشہ (رضي اللہ تعالی عنہ)! کیا تم نے کبھی مجھے بری یا گندی زبان میں بات کرتے سنا ؟ یاد رکھو قیامت کے دن وہ لوگ الله کی نظر میں سب سے برے ہوں گے جنھیں لوگ علیحدہ کر دیں یا ان سے کنارہ کر لیں تا کے انکی فحش زبان یا گناہ سے اپنے آپ کومحفوظ رکھ سکیں. Narrated Anas(Razi Allah Ta'ala Anhu)The Prophet(Sallallahu Alaihi Wa'alehi Wasallam) said, "Whoever possesses the following three qualities will have the sweetness (delight) of faith. انس(رضي اللہ تعالی عنہ) سے روایت ہے کے نبی(صلی اللہ علیہ واله وسلم) نے فرمایا جو کوئی ان 3 خصوصیت کا حامل ہو گا ایمان کی شیریں لذت پاے گا. 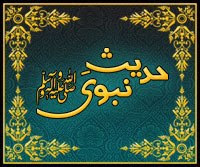 Sayyedena Abu Huraira (R.A) kehtye hai ke Rasool-Allah (SAWW) ne farmaya ke shaitan tum mai se kisi ke pass aye ga or kahye ga (batao) fala cheez ko kis ne peda kiya, fala cheez ko kis ne peda kiya hai, yaha tak ke kahye ga tumharye parwardegaar ko kis ne peda kiya hai. Pas jab yaha tak nobat pounch jaye too isye chaye ke Allah se panah mange or chup ho jaye. Shall I Inform You of the Biggest of the Great Sins? "Shall I inform you of the biggest of the great sins?" 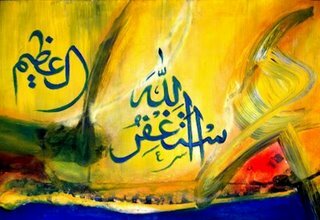 sahaba said, "Yes, O Allah's Apostle!" He said, "To join partners in worship with Allah, and to be undutiful to one's parents. " The most frequent invocation of Prophet (Sallallahu Alaihi Wa'alehi Wasallam) was: "O Allah! Give to us in the world that which is good and in the Hereafter that which is good, and save us from the torment of the Fire." نبی(صلی اللہ علیہ واله وسلم) اکثر یہ دعا کیا کرتے تھے: "اے اللہ ہمیں دنیا میں وہ عطا فرما جو(ہمارے لئے) اچھا ہے،اور آخرت میں وہ عطا فرمانا جو اچھا ہوگا اور ہمیں دوزخ کے عذاب سے بچا"
عمر بن السلامہ(رضي اللہ تعالی عنہ) سے روایت ہے کے ایک دفعہ میں نے نبی(صلی اللہ علیہ واله وسلم) کے ساتھ کھانا کھایا اور میں تھالی میں ہر طرف کھا رہا تھا. تو آپ(صلی اللہ علیہ واله وسلم) نے مجھے کہا " تھالی میں سے وہ کھاؤ جو تمھارے نزدیک ہے. "Tum mein se Jiss Shakhs ko ye pasand ho ke us ki Rozi Barh jaye Aur uss ki Umar Barha di jaye to usay chahiye ke wo (Logon ke Saath) Acha Sulook karay." 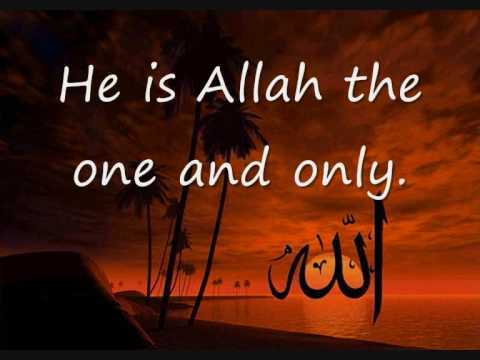 Narrated Anas bin Malik (Razi Allah Ta'ala Anhu) that Allah's Apostle (SallAllahu Alaihi Wa'alehi Wasallam) said, "If Adam's son had a valley full of gold, he would like to have two valleys, for nothing fills his mouth except dust. 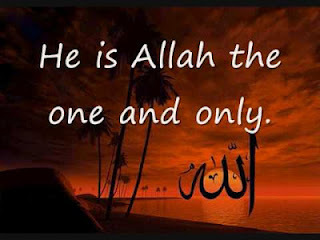 And Allah forgives him who repents to Him." انس بن مالک(رضی اللہ تعالی عنہ) سے روایت ہے کے نبی(صلى الله عليه واله وسلم) نے فرمایا .. اگر انسان کے پاس سونے کی ایک وادی ہو تو وہ 2 وادیوں کی خواہش کرے گا، لیکن انسان کی خواہشات کو موت کے سوا کوئی اور چیز نہیں پورا کر سکتی. اور الله اسے معاف کرتا ہے جو اس سے توبہ کرے. "The hand should be cut off for stealing something that is worth a quarter of a Dinar or more"
حضرت عائشہ(رضی اللہ تعالی عنا) روایت کرتی ہیں کے نبی(صلى الله عليه واله وسلم) نے فرمایا.. ایک چوتھائی دینار یا اس سے زائد چیز کی چوری پر ہاتھ کاٹ دیئے جانے چاہیں. Prophet(SallAllahu Alaihi Wa'alehi Wasallam)said, "The hand should be cut off for stealing something that is worth a quarter of a Dinar or more." "جس نے ایمان کے ساتھ اور ثواب کا یقین رکھتے ہوئے شب قدر میں عبادت کی اس کے پچھلے گناہ معاف کر دیے جایں گے اور جس نے ایمان کے ساتھ اور ثواب کا یقین رکھتے ہوئے رمضان کے روزے رکھے اس کے پچھلے (صغیرہ ) گناہ معاف کر دیے جایں گے . " Hazoor (S.A.W) ne farmaya jo shakhs jhoot bolna aur ghalat kam na chore to ALLAH ko koi zarurat nahi k wo (roze ka naam kar ke) apna khana peena chor de. Aik Shakash ne Nabi Kareem (SAW) se poocha k kon sa amal sab se afzal hai? 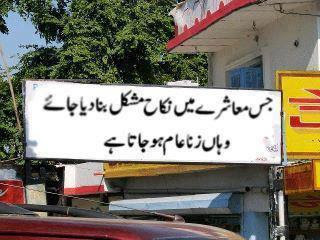 "Apnye waqat per namaz perdhana or waldein (Parents) ke sath naik muamala kerna, phir Allah ke rastye main jehad kerna"